EDIT 12/29/16: This thread has been replaced by a new one. You Can Find The New Thread Here. If you are wondering about the title of this thread: yes, it is real, it is legal, it does work, and Mustachians have been making thousands of dollars a month doing this for the last six months since I started this thread. Go to that other thread to read about it. Information below this post may be outdated or incorrect, please see the new thread, linked above. Here's the (very simplistic) spreadsheet I use to track my trade line sales. I don't track the names of the AUs and such, since the site I use has an interface that has all that. Here I just track which of my cards are in the system, how many AUs I've added, if I've done the spend on the card for the month, and if I've paid off the card. I've blanked my data and uploaded it, so you can use and tweak it if you want to. Here I put the CC company, the last 4 digits of each card, how long the card's been opened, when the statement close is, what the credit line is. I also put how much I earn per trade line (AU), and the number of slots I might sell. I just play around with this and make projections. I track my SO's cards here, too. On this, it has the same info (for each card), and has additional Spend Done? and Paid Off? columns. Initially, for the month, all of the # of slots sold (column J) are 0. Then when I get a request to add an AU, I go do that, and change the number of slots to 1 (and later 2, or whatever, if I sell more for the same card). When I spend on that card, I put a P (for pending), and then when I confirm that spend posted to the card, I change it to a Y (yes). If I haven't done the spend yet, I put a N (no). These turn yellow (pending) or green or red (y/n, respectively). I wait to pay off the cards until after the statements close, so I often go back to the previous month and do the Paid Off column, just to make sure I never pay any CC fees/interest. You can obviously do auto-pay, or however you prefer it. This will then calculate my total earned for the month, since it will vary by month (the one on the first tab is just for fun, to play with/project "IF I get this many AUs..."). 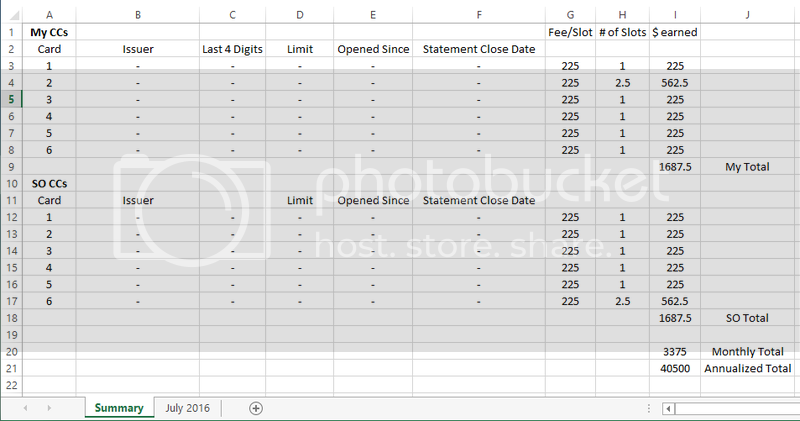 Each month I just copy the previous tab, set all # of slots to 0, and delete the spend info, and then get ready to do it again. Any suggestions or improvements welcome! Thanks for the solid write up. I wasn't going to consider this, because it seemed like a hassle. But we've got oodles of old accounts that I never use, Like, 20 years old, >> $10k credit lines. I dunno, maybe it's worth it. Given the risk, it's probably a good idea to not put the oldest card in this scheme - as the closure of that could adversely affect my credit score. But the ones opened in 2001? Eh, at this point - why not? I think I'll do a little inventory and see what I've got. This is interesting ...first I have heard of it... Thanks for sharing. I'm intrigued, since I'm already considering doing a lot more credit card churning (well, more like slow wave-ing given our spend rate). Might be a good way to keep getting value from those cards. I would absolutely love to do this, but my husband works directly for one of the major credit cards. We try to use their cards exclusively. We might have some open lines with competing companies that we never use. I would probably stick with doing it with those cards :). It seems highly unlikely, but could this be considered some sort of employment breach? It sounds like it's something that the banks discourage and not the credit cards themselves. Or both? I'm just recalling how when my BIL worked in finance for a bank he always claimed it was against his employment to do certain things like a short sale. Or maybe he was just blowing smoke? I've been doing this for about 6 months with no problems so far. I don't have a ton of cards with 2+ years of history, so I have only been using one card so far. I am also afraid to use Chase because they have all the best cards for churning. I don't want to jeopardize that. It's been a really easy $200/month for me so far. Probably 5-10 minutes per month required. To everyone else that has been doing it, how many spots do you go with per card (do you do the maximum on each card), and have you ever had any negative responses from the banks for it? My two oldest cards are US Bank and AmEx. Neither are on your list of cards - do you have any idea if they would work? This strikes me as really sad for the people buying the AU spots. I don't feel particularly bad for the credit card companies, because, as you say, they have recourse if they don't like you doing it. (And TOS are not written with customer's best interest in mind). But I couldn't in good conscience enable other people to go into (most likely) bad debt quite so directly for my own gain. But that's just me, I guess. Sounds cool, one question. Do you get paid right away when you sign some one up as an AU, or do you have to wait some period of time before they give you the money? It's gonna be a 1099 misc. They won't withhold taxes. So you'll have to track that on your own. How do I figure out how much to with hold? It'll be at your marginal rate for federal and state tax, then 15.3% FICA self employment tax ( I think, otherwise 7.65%). It'll be at your marginal rate for federal and state tax, then 15.3% FICA self employment tax. So for Colorado and Federal and FICA is 4% + 25% + 15% = 44% taxes? Holy sh!t. I'm not claiming as a business. I'm just claiming as misc income then you avoid the self employment tax. It's not hardly enough income to raise a flag imo. It's all free money why do you care about withholding. You're on this site just save it and don't spend it. Just look at my post above this as well you could come out ahead claiming as a business if you were close to the ss max and use a sep IRA. This is a thread right now on r/churning, what do you guys think of this comment? I know a few of you guys are getting paid for credit piggybacking. I was doing it for several years, but started hearing about friends who have gotten warnings. Citi recently sent my friend a warning that everyone he had added through the credit boosting agency as an authorised user was fake, and didn't exist. So some of these companies may be intentionally defrauding banks by creating fake people as part of an identity theft ring. I'm thinking they may be children's SSNs or dead people. This is very interesting, and I've never seen it before. I have two ethics questions. 1) You are representing this person as an authorized user of your card, when in fact you are never authorizing them to use the card. Isn't this straight up lying? 2) Similarly, the person using the service is representing that they are an authorized user of the card, when they aren't. Isn't that person similarly lying? And aren't you facilitating that person misrepresenting their credit worthiness? Interestingly, I think many of the ethical questions would disappear if you actually allowed the authorized user to use your card for some period of time. Why would you need to let them use a card with a long credit history to make it ethical. They wouldn't have been using it the whole time. This is something fico 8 tried to shut down and the cc companies said no. So who cares. If some body who has never had credit wants to buy a house and this helps them great. If it's some guy with a history of defaults those will still affect their credit. I would be extremely careful. At the very least, google the name of the people you are adding and see if anything is fishy. Everyone has their own comfort zones. Personally, it's the $1000-$3000+ that the "customers" are being charged that gets my ethics radar ringing. Rebs seems to think that all parties are entering this arrangement knowingly, but I can't help but think there is deep despair that's being taken advantage of. Thanks for helping answer a bunch of questions Border! Going through the thread now, let me know if I missed your question. Yeah, you can always keep your oldest one(s) out, and use some that are newer (but still older than 2 years). The older it is, the more likely someone is to purchase it, but you get paid based on the credit line, not age. And like I said in the OP, even if it's closed, it stays on your account for up to 10 years, so it won't affect your credit score being closed (aside from available credit/DTI) for a long time, plenty of time to get other cards. Definitely only do what you're comfortable with, but I'm a fan, and I figured others may be interested, too. Might be a good way to keep getting value from those cards. Exactly. In fact, I had two that just hit their second year, I enrolled them, but was debating cancelling (had $95 annual fee), then I got two orders on one of them. Decided to keep them both. I would absolutely love to do this, but my husband works directly for one of the major credit cards. We try to use their cards exclusively. Yeah, I wouldn't violate the terms of service of a CC company if they're your employer. In the scenario above ("Would you take 50-100k to close old CCs), the risk is you have a few old CCs closed. Big deal. But add "...and lose your job" and it becomes "nah." Just not worth risking your job, most likely. If you are knowingly violating your credit card company's terms of service, how is that not unethical? I knowingly violate a LOT of terms of service. You probably do as well, knowing or unknowingly. Ever shared a password to a website with anyone (Netflix is a common one, but even something like your email, or Facebook, or bank account, with your SO even)? You can't do that, per their terms of service. If a company put in their TOS that I couldn't donate money to starving orphans (or to a certain political affiliation, or whatever), I'd click "I agree" and then ignore it. Whatever is in "Terms of Service" isn't automatically ethical, or not. I can see the argument that you should just not agree, and not use that service, and if that's your position, that's fine. I think there's a lot of things then that you'll need to stop doing that you do today. I think there's a difference between legality and morality (a common philosophical debate), and I think there's a HUGE difference between terms of service and morality. Do you have any information about AUs on business credit cards? No business cards, sadly--they don't report the same as personal ones, so they don't work. I've been doing this for about 6 months with no problems so far. US Bank, yes. Amex, no. There's a month lag. Obviously there's no way for them to know that you actually added them until it shows up on the other person's credit report. So you add them, a bit later the statement closes, a few weeks later it's on their report, and then you get paid. Same as any other side-gig income, at your marginal rate. I mean.. I suppose that's possible? I'm skeptical. If it were true, I think they'd post a copy of the letter received (that's the sort of thing they would send registered mail, not via a casual phone call or something), w/ info redacted if necessary. I wouldn't be surprised if it was FUD from someone who doesn't want it to become popular for fear of the market getting flooded, so they make up a story. I also think ID theft is so easy/cheap nowadays (vis-a-vis the Internet--I've read in various articles talking about ID theft that you can buy a stolen ID/credit card for something like $40 on the Internet) that I don't see why someone would pay money to this service to get credit for someone that doesn't exist or is dead, or whatever, when you can easily and cheaply get REAL IDs. So that's a second reason I'm skeptical. I'm of the belief that 100% or more are people exactly like what I described in the OP--people looking for a temporary boost in their credit--and I'll think that until given real reason to think otherwise. If and when that happens, I'll reevaluate. They ARE authorized to use it, for that month or two. They just have no means to actually use it (they have no card, and no way to get one). How is that lying? I did authorize them to use it, and two months later I unauthorize them. Also, even if we decide that it IS lying, is lying always wrong? In a Kantian view, probably. In a utilitarian, certainly not. If I'm helping these people save interest over the greedy banks, it might be more moral for me to lie (if it helps lift them out of poverty). We can have some fun ethics debates around it, for sure. And I can see why one might find it unethical, like I said. So this question by spicykissa was the only one I answered out of order (moved down to the end), because it grouped nicely with Paul's. Here's the thing about it, to me. These people are in a tough situation, no doubt. They have bad credit, and are trying to buy something. But to me, this is helping them. First, think about the alternative if they don't do this. Do I think they'll go "Oh, the interest rate is 18%, guess I won't buy it."? Of course not. They're going to buy it regardless. But if they know about this, they can boost their credit and get a reasonable rate. That might be the difference between them being able to make ends meet, or not. I know exactly what you two mean about their end of the transaction being potentially evil. I absolutely would not fund a payday loan place. They're predatory, and unethical. The vast majority of the time, people are digging themselves in deeper, and the tactics used are scummy. But this actually seems like the opposite of that--a flat fee, which gets them a lower interest rate and saves them money? So I don't feel unethical from the standpoint of thinking about them, because I do actually think it helps them. I might be wrong about how it ends up helping them, or not, but that's how I picture it, and this service allowing them to pay a flat fee in order to avoid usurious rates is a GOOD thing. Does anyone know if this is an option for Canadians living in Canada? I have no idea. Probably depends on how your credit scores work, and how your credit cards report. I know for the companies I've looked into, it needs to be a card that reports to our credit reporting bureau (Equifax, TransUnion, Experian). There may be separate trade line companies specializing in Canada ones, if your system works the same (with AUs). They're not authorized to spend money on the card. The fact that you add them as an authorized user, but then never give them a way to use the card, is exactly what makes it lying. I agree that that would be unethical in a Kantian sense. Not sure about utilitarian – after all, the reason you have the credit score you do is because of your history. Misrepresenting others credit histories will, if this happens in sufficient volume, make credit scores meaningless, and increase the cost of credit to those most likely to repay. I'm skeptical whether evening the credit rates across the population—i.e. disconnecting credit score from likelihood to repay—is a positive thing. This is similar to another question I have as I start looking into this. If someone uses this service, and then commits some sort of crime, which was helped by them becoming an AU on your credit card, could you be held liable in any way? I know that's pretty vague and probably unlikely. But say I helped someone boost their credit score to get access to a rental or something, and then they commit a crime on the property. Or someone uses their improved credit for the purposes of being able to do something illegal. I may not be in danger of criminal charges, but seems like I could open myself to some sort of civil suit by the victim, property, etc.. Maybe not. It would never cross my mind to try and profile people based on their name. I don't think there are any names I know of that I would even want to, had it occurred to me, or people any less deserving of using a financial loophole to lower their interest rate. If anything, it's the people who are the most taken advantage of in society that can use something like this. They're not authorized to spend money on the card. Sure they are.. they just have no way to do so. The fact that you add them as an authorized user, but then never give them a way to use the card, is exactly what makes it lying. I don't see a need to debate it any more, we obviously differ in how we view it, and that's fine. I'm skeptical whether evening the credit rates across the population—i.e. disconnecting credit score from likelihood to repay—is a positive thing. I'd actually think someone savvy enough to realize they can get a better rate, and financially aware enough to do so would be more likely to repay (i.e. they had credit issues in the past, but are better with money now), than someone who doesn't think through finances like this, and then pay 18% or whatever, especially given the money they'll then save on the interest. I have no proof for or against this idea, but I have no reason to think someone aware enough of their financial situation, taking steps to decrease the interest rate they're paying, and then actually getting a lower rate (so less burdensome interest payments) will do worse than someone who does none of that, and just gets a bad interest rate. And, like I said, they're going to get the thing anyways, 99% of the time. So if this is the difference between them making their rent payment or not, due to less interest paid on their car, or the difference between them getting to keep it and having it repossessed, or whatever, that seems like a good thing, to me. I don't know, I'm not a lawyer. I guess consult a lawyer if you're concerned about this? Like I said above, I think the people using this are as I described in the OP: people looking to temporarily boost their credit in order to lower their interest rate. I have no knowledge otherwise. From Wikipedia: "An accessory must generally have knowledge that a crime is being, or will be committed" -- I don't have any knowledge of this, or even any suspicions. I think without any sort of knowledge of it, or any intent to commit a crime, there's no mens rea, and it'd be difficult to accuse you of being party to it. Like I said though, if you're concerned, consult a lawyer. It's not a concern I have though. Odd thought. We're in the process of selling my DH's family home to his cousin. I don't know what her credit is like (probably not bad, but not all that good since she's a single mom who's a teacher), but I'm now thinking that adding her as an AU on a card might help her qualify for a better rate. Have to think about that. So if this is the difference between them making their rent payment or not, due to less interest paid on their car, or the difference between them getting to keep it and having it repossessed, or whatever, that seems like a good thing, to me. If I'm recalling correctly, this aligns with your take on Kiva. i.e., I think you once said you don't like or support Kiva charging crazy-high interest. You and I feel differently about Kiva, which is totally fine, of course. But I appreciate the consistency in your take, and am happy to point out here that this activity is not one you apply only to make personal cash—it's a perspective you apply in various scenarios, whether you are making money or not, and including when you give charitably. You are ethically opposed to crazy high interest. You like increasing people's access to necessities. You see a relationship between high interest and some people's inability to eat or be sheltered. You see differences in 'legal', 'legalistic', 'moral', and 'ethical'. I appreciate all of that. Yup, absolutely. I hadn't thought about the connection, but you put it beautifully. I think we all draw different lines in different places, and have our own ideas of what is moral/ethical, and it's important to know what your values are, and live accordingly. I would be very careful with this. This appears to be a classic scheme to defraud, and it is a federal crime because of the use of the wires (emails, money transfers, etc.). The key is that you're assisting in a scheme to mislead the entities issuing credit to the people that you seek to add as authorized users. Put aside the ethical issues for a second. Those entities lend money to individuals at a certain rate based on a certain credit history. Anything dishonest misleads the entities into lending at a different rate, and the consequences in aggregate do matter assuming that the entities price their credit correctly. It doesn't matter whether you believe the credit entities should charge the rates they do, etc. The only thing that matters is the misrepresentation to the entities extending credit of those individuals credit histories. So how does that affect you? You're helping them in the scheme to defraud. Specifically, by adding them to your credit card as authorized users, you create a false credit history for them. It doesn't matter that they're not family members or that there is an "other" category. The misrepresentation on your part is that they are authorized users. An authorized user is one who has access to and the ability to use the credit on your credit card. In fact, they do not. While you feel protected behind the shield of the fact that the card is just sent to you, that's easily penetrated when you have a number of different individuals not associated with you in any way who purportedly have the ability to use your cards but never do. Intend to place a few charges on those cards to make it look legit? See--there's a fraudulent act to make it legit. While you could claim ignorance for one or two and you probably wouldn't be prosecuted, once you do this on a systematic basis, it's going to be easy to prove that your authorized users are nothing of the kind, and that you're getting paid to add them shortly before they apply for credit somewhere else. How else do you prove it? You're getting paid. For what? If the purported authorized users can't actually use your card, then there's no risk of unwanted charges. The only risk you bear is that you might lose your credit card, but that's not a legitimate risk--that's a risk because you're knowingly violating the terms of service for the credit cards. So if you're not getting paid for a legitimately born risk, and you're not adding any legal value, what are you being paid for? To assist the fraud. It's just like the people who launder money. Feel like the banks don't really care, so it doesn't matter? Not a legal defense. It was pushed frequently in the mortgage fraud cases on the basis that the banks just wanted to issue mortgages and didn't care about misrepresentations of salary, references, etc. Too bad. Courts held that was not relevant, and not a defense to the misrepresentations (or assists--if you were the one who offered the purported salary or job reference) in a mortgage fraud case. Again, all I can do is recommend that you think very carefully about proceeding with this. Think in particular about what exactly you're getting paid for, what the benefit is to the purported authorized users, and how exactly they benefit. Once you boil it down, the ultimate goal is to mislead the banks extending credit to the purported authorized users in order to get a better rate, and that's fraud. All it takes is one interstate wire--which includes a wire of money, and email, anything, almost all of which travel across interstate or international lines--and now it's federal. The case is also easy to prove. Again, not an issue if there are just one or two, but once you engage in the pattern, all it will take is subpoenas to the banks for your records, the bank and payment records for the intermediary entity you're referring to, DMV records for the purported authorized users to show that they have no connection to you or to each other, and indeed, will almost certainly have a comical (to the jury, not you) lack of geographic ties. The credit entity will testify that they based their loan rate on the belief that the purported authorized user was legit, and the records will show the money to you. The purported authorized users will testify against you, and they won't be prosecuted because they'll be one off individuals who will get away with claiming that they didn't know that they weren't really authorized users, didn't know what that term meant, etc. But you won't because there's a pattern, and all the prosecutor has to show is your purported users weren't ever in fact authorized to do anything. And if you have any thought to paper over it by putting a few charges on the card, ask yourself why you're doing that. Because it's going to look to the jury like your attempt to make them appear authorized, showing that you knew they weren't really authorized users and negating an ignorance defense. I enjoy your posts and all the very helpful advice you give on this board. I'm not looking to debate any of this, but consider it my contribution to your thought process in deciding if this is something you really ought to do. And to be clear--none of what I'm saying is based on ethical considerations. It is entirely a question of criminal fraud law. And I'm not giving you any legal advice. Just things to consider to do with as you will. Thanks for the post, Cycling Stache. Definitely something everyone considering this should read. Realistically, I think it's far more likely that if/when this becomes a problem that the primary resolution is modification for how credit scores work to only include cards where someone is the primary account holder (and not just an authorized user). Managing and enforcing a "user must be real authorized user" policy is frankly a nightmare. Sure, the government can shutdown and subpoena information for everyone who participates in formalized entities doing this. But that's a big bandaid over a more fundamental problem -- that being an authorized user, with no actual accountability fiscally, somehow improves your credit score. Fico 8 already tried to address this issue and the cc companies said no they wanted it left in place. I don't see how it's wire fraud I think that's quite a stretch. If any aspect of this was wire fraud the companies creating the connection wouldn't be operating on US soil and that would raise all sorts of red flags. There is no law against adding someone as an authorized user to increase their credit. Traditionally it has been a relative or a spouse but there is no law against it. The same logic could be applied to credit card churning for sign up bonuses. Or the tax loop holes people use. You can derive almost anything that's a grey area to "fraud"
There is likely a small window for this bc it will be exploited and cc companies will change their terms or just start canceling and blacklisting people. All of this should be treated with caution. First, with regard to the intermediary companies. I don't know the companies, but how are they publicly representing the services they provide? I'm guessing this is not a yellow pages/ads on TV kind of business. Just because people do something doesn't make it legal. Second, there is a law against adding someone as an authorized user to increase their credit if the purpose and act of doing it is to materially mislead someone else. It's fraud, typically involving wires in a case like this because almost anything is likely to be transmitted electronically (else, it would be mail fraud). Federally, wire fraud is 18 USC section 1343, and aiding and abetting (which makes you equally criminally liable) is 18 USC section 2. Again, ask yourself what "benefit" you're getting paid for. The answer is helping someone to get a false credit history that they can use to mislead a financial institution. Third, credit card churning is different. Credit card churning involves your signing up for a credit card in order to get a bonus. There is an exchange of benefits. You don't misrepresent your past (hopefully), and in exchange the credit card company gives you a credit card that they hope you'll use. While churning might be (okay, typically is) a violation of terms of service, the key different is that you do not make any material misrepresentations (read, fraud) to the credit card company. The key here is the material misrepresentations. While you might not be prosecuted, you need to realize what you're getting paid for. In this case, it's to help the authorized users get a false credit history. Two or three times, probably nobody cares. But do it to the tune of $20k-$40k a year to help mislead financial institutions? Don't pretend that's not enough to warrant federal attention. If you're not sure, pull some cases involving people who assisted with mortgage fraud or health care fraud. People who work at the bank, people getting $100 per reference, etc. If they knowingly participate in the scheme to defraud, they're liable. Again, I'm not giving legal advice. But it is worth knowing and understanding the law as it may apply. It's not a false credit history. It is infact part of their credit history as credit is calculated. Which cc companies explicitly wanted left in due to credit for sahp who shouldn't have good credit either. As I said earlier it's a stretch you're making in my opinion. But let's take your banking instance. How many of those bankers went to prison. None. Well one guy. Personally I don't feel I'm misleading anyone. I'm simply adding a user to a card in a system that allows for that. It could easily be argued that the way in which fico scores are calculated and used are then fraudulent due to allowing this ( which I dont think is fraud, but that would be where the fraud would lie). Cycling Stache's concerns are absolutely worth consideration. I personally disagree, and would add that even if s/he's right, the odds are low that any individual would be prosecuted. (For example, the RIAA no longer tends to go after individual downloaders, but people who upload things, typically before they're released). If there were some fraud, and it were prosecuted, I think the credit boosting companies would be the ones they'd go after (and the people actually doing the fraudulent activity, using their new higher credit score). I think it unlikely that of the thousands doing this, you personally would be the one taking the fall. But it certainly is possible, I suppose, and Cycling Stache's posts should definitely be read and considered by anyone interested in selling their CC trade lines. Like boarder42 says, almost anything can be construed as "fraud," but whether it actually is or not would eventually be up to some prosecutor/judge. I don't feel this is, but you'll need to decide on the risks, ethics, etc. for yourself before you dive in. When you signup and sign a contract, do you have the option to do one or two and then wait a few months before you do any more or are you required to keep adding them as that is part of the contract you signed? The reason i ask is that I churn and MS, so I would rather not get cards cancelled/blacklisted, but I'm obviously open to accepting some risk in return for generating $$$. The misrepresentation on your part is that they are authorized users. An authorized user is one who has access to and the ability to use the credit on your credit card. In fact, they do not. While you feel protected behind the shield of the fact that the card is just sent to you, that's easily penetrated when you have a number of different individuals not associated with you in any way who purportedly have the ability to use your cards but never do. Intend to place a few charges on those cards to make it look legit? See--there's a fraudulent act to make it legit. You defined an authorized user as having both "access to" and "the ability to use". That's an interesting choice. DEFINITION of 'Credit Card Authorized User' A person who has permission to use and/or carry another person's credit card, but isn't legally responsible for paying the bill. Note that their definition - which may not be the legal definition - does not mandate "the ability to use". As such, one might ask whether it is the act of telling your credit card company "this is an authorized user" that makes them an authorized user. If that were the case, then it would be difficult to make a case that these are not truly authorized users. There's a lot more in your note, and I share your wariness about this scheme (it's definitely not for me), but I found this particular definitional question interesting from an intellectual perspective. Though I've got to say - that wikipedia article sounds like it was written by someone who desperately wants the practice to seem acceptable. Do you pay the balances early enough to avoid interest charges? Have you been doing this long enough to actually get paid, and did you? Of course, you should always do this. You let the statement close, and then you pay it before its due date. Not yet; I should in about two weeks. I heard about it at a breakout session at Camp Mustache III over Memorial Day. I signed up in early June, got my first tradeline sales in mid-June and the second half of June (we got 8 tradeline sales in that half month, have 7 so far this month, and probably more coming in the next two weeks from cards closing towards the end of the month). So I should get payment for those June trade lines here at the end of July. The last pay date was June 30 for May orders, but we hadn't started at that point. How's the junk mail? That was one of the complaints on the reddit thread I posted. Most of our accounts are registered at our address where renters live, and the others are registered with my parents. I don't want them to start getting a bunch of junk mail addressed to random people. Of course, you just started, so probably you don't have much junk yet. I'd be interested to hear if you start getting a lot though. DH is totally sketched out by this scheme. So I won't be registering his 2001 mastercard with a$45k credit line :(. How's the junk mail? That was one of the complaints on the reddit thread I posted. EDIT: Got an answer to this, placed in my next post in this thread, here. tl;dr: You may occasionally get a piece of mail for them (it's rare), and you can just write "return to sender" on it and stick it back in the mail and you shouldn't get any for them again. I think the idea behind the junk mail is that their name would be associated with your address because you signed them up for a credit card at your address, therefore if the credit card companies are selling names/addresses, you could get stuff to that name at your address. For a while I was getting occasional mail addressed to my parents at my apartment (in a city where they'd never lived) and I'm guessing it was because they had me as an authorized user on one of their cards and somehow, in some database, that meant we all lived together. Who cares throw it in the trash?